Adding coffee or espresso to a recipe can infuse some coffee flavor, but it tends to be on the mild side unless the recipe can accommodate a lot of it, as Mocha Pudding Cake can. I find that it’s often better to use coffee extract, instant coffee or other coffee-flavored things, like Cappuccino chips. The chips are made by Guittard and have a distinctly milky coffee taste to them. They’re not too sweet, even though they’re made of white chocolate, and add a nice extra boost of flavor to a recipe. 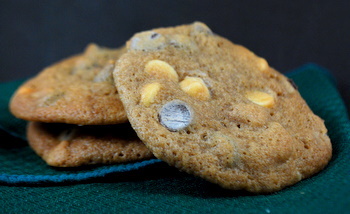 These chocolate chip cookies have real coffee in the dough, as well as cappuccino chips, chocolate chips and white chocolate chips. They’re delicious when they’re still warm, served with milk or coffee, and have a nice chewiness to them even after they’ve cooled. Espresso can be substituted for the coffee, as well. In a large bowl, cream together the butter and sugar until fluffy. Beat in the coffee, egg and vanilla extract. With the mixer on low speed, or working by hand, blend in the flour mixture. Stir in the various chocolate chips and walnuts at the end. Drop dough by rounded teaspoonfuls (approx 1-inch balls) onto prepared baking sheet. Bake at 350F for 10-13 minutes, until cookies are lightly browned at the edges. Cool for a minute or two on the baking sheet before transferring to a wire rack to cool completely.